Amazon Kindle Fire: How it compares to the iPad. Amazon launched the Kindle Fire at the ground breaking price of $199, making it a wallet filling $300 cheaper than Apple's cheapest iPad. Given Amazon's incredible price point you could buy the entire Kindle e-reader range, including the Kindle Fire, for less than the cost of an iPad 2. The question is however, is the Kindle Fire actually a bargain, or are you better off putting your money on the counter and paying full whack for an iPad? The table below compares all of the specs of the two tablets so you can see at a glance how they match up. Size 7.5" x 4.7" 9.5" X 7.31"
Amazon have built the Kindle Fire from the ground up as a way of viewing content - whether videos, books, games or other content types. 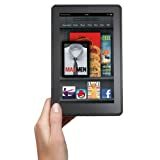 The Fire offers an easy way to download content from Amazon's huge range and the books and videos that you buy are stored in Amazon's "Cloud" servers, so saving space on your Kindle Fire. The iPad 2, on the other hand, is designed to also allow you to create content as well as view it, with a fully featured Office suite app available to download. The iPad 2 also features front and back cameras to allow you to take and edit photos and videos. Apple have made it abundantly clear that they will never offer Flash support on the iPad. This means that unless Flash is phased out many websites and games that require Adobe Flash to use them will never be accessable on the iPad. By contrast, Amazon have confirmed that the Kindle Fire does have Flash support so allowing all the Flash websites and games to be enjoyed on their tablet. Given the number of sites that currently use Flash this is a major advantage for the Kindle over its competitors and one that creates a good reason to purchase it over and above the vast difference in price. The iPad and Kindle Fire are both described as tablets but they are actually significantly different in both size and weight. The iPad 2 has a 9.7 inch screen and so is noticeably larger than the Kindle Fire with its 7 inch screen. What you lose in screen size with the Kindle Fire, you more than make up for in portability; the Kindle Fire is only 7.5" x 4.7" which is little bigger than a book. The iPad 2, by contrast, is 9.5" x 7.31" and so far harder to fit in a small handbag or a jacket pocket. The iPad 2 is thinner than the Kindle Fire at only 8.8mm compared to 11.4mm for the Kindle Fire. In the hand though, you're unlikely to notice the extra 3mm. The Kindle Fire also outguns the iPad 2 on the all important weight issue, weighing only 414g compared to the iPad's 601g. This means that the Kindle Fire can be read on a crowded train one handed with ease like a normal e-book reader. The iPad 2 can be too heavy and bulky to read one handed. The iPad 2 features Apple's Safari browser which is a tried and tested portable device browser. Amazon have though brought their own browser to the table with a range of new features. The key selling point of the Amazon Silk browser is that Amazon will store webpages on their own servers. Whilst explaining the technical aspects of this is beyond the scope of this review, what it means for you as a user is that downloading a webpage will be faster than if you were using an iPad. The Silk Browser is even reported to have predicative abilities so that it starts to download new pages based on what it expects you to click on next, so greatly reducing the wait time. Whether this turns out to be helpful or not is yet to be seen, but anything that can speed up a tablets download time is a welcome feature. Which Are You Planning To Buy? Heard The Song From The Kindle Fire Commercial? Are you looking for the name of the song from the new Kindle commercial? Kindle Fire for me. My kids will get one for Christmas this year I think. Good comparison, still not sure which one to buy yet. Thanks. Good Job. Planning to get the Fire since I have an iPod Touch 4 and all I need is a few apps and GOOD internet browsing. I love how android powered stuff supports flash( after all the fire is powered somewhat by android ). That's what I call good. Not to mention it's less than half the price of the iPad 2. We just cannot stop loving Kindle Fire but I also recognize that the storage of iPad 2 is very tempting, I think it is based on what we want to do with the devise we want to have it. Thanks Steve, I agree. I'm desperate to get my hands on one. Roll on Nov 15th. Very nice comparison. The portability and price just make the Fire so attractive.